An artists’ rendition of a Palmdale Veteran Enriched Neighborhood home. Homes4Families has broken ground on a 56-home Veteran Enriched Neighborhood for low-income veteran families. The 10-acre site at Avenue R and Division Street will include a community garden and a community playground. 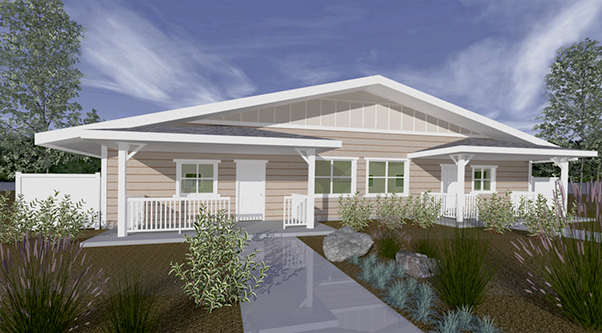 All the homes will be single-story, and several will be fully ADA accessible units. 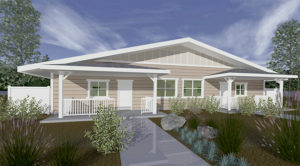 For the Antelope Valley’s population of low-income and homeless veterans and their families, some hope prevails that they can move from the precarious housing situations they endure night and day, to a secure dwelling complete with kitchen, bedrooms, a living room and indoor plumbing — essentially a place to call home. That vision is becoming possible through the efforts of an organization called Homes4Families, a nonprofit group, and its network of corporate and community partners. After successfully constructing Veteran Enriched Neighborhoods in several Southern California communities, most recently in Santa Clarita, fundraising is underway for the newest Homes4Families development in the city of Palmdale. Hunt Braly, Homes4Families Board of Directors chairman, outlined the financial needs for the project to a group of more than 100 community leaders and dignitaries who attended an informational lunch March 26 at the Antelope Valley Country Club. According to Braly, the organization is seeking corporate, foundation and community contributions of $56,000 per home, with $40,000 of that going toward construction and $16,000 for enrichment services and the community common areas. The Palmdale project will include 56 units, with 10 of them being fully ADA compliant, to accommodate veterans with special health needs. Braly said only 2 percent of the funding raised for the Palmdale community will go toward administrative and overhead costs. The balance of the funds go toward services and construction costs. A total of $3.1 million is needed for the project. “The city of Palmdale has been tremendously supportive,” Braly said of the project planned for construction at Avenue R and Division Street. Palmdale contributed the land, he noted. This project also has the backing of local elected officials including Assemblyman Tom Lackey, R-Palmdale; State Sen. Scott Wilk, R-Santa Clarita; Los Angeles County 5th District Supervisor Kathryn Barger; Congresswoman Katie Hill, D-Acton; and the entire Palmdale City Council. Former Congressman Steve Knight and wife Lily, Homes4Families volunteers, also showed their support by attending the event. Deutchman said Homes4Families makes every effort to collaborate with the various veterans’ programs that already exist locally. “We never want to take away. We want to add. The city is behind us. The county is behind us. The state is behind us. “There is a desperate problem of homelessness amongst our veterans. We want to prevent homelessness, to the extent we can. We have a model where we can build homes and charge the same amount as a one-bedroom apartment,” Deutchman said. That means veterans can afford the homes “and move up the economic ladder,” Deutchman noted. “They also need to have that continuum of care,” in areas including financial literacy, health and wellness, child development and trauma care to treat the invisible wounds of war. “That’s why we’re doing the Enriched Neighborhood Program for veterans.” The program is based on proven results, as well as over 10 years of research, and includes a partnership with the California Department of Veterans Affairs. More than 380 families have been served in five Enriched Neighborhoods to date. The Palmdale Veteran Enriched Neighborhood is currently under construction on a 56-home CalVet REN (Residential Enriched Neighborhood) for low-income Veteran families in the city of Palmdale using the Homes 4 Families Veteran Enriched Neighborhood model. Donielle DeLeon, director of Corporate and Community Engagement, focused on TEAMBuild, a program for corporate and association groups to get involved. Corporations like Northrop Grumman, Lockheed Martin and Antelope Valley Chevrolet in Lancaster decided on an amount of money they want to contribute and then a group of company employees and managers spend a day working at the construction site — a sort of pay-to-play approach. DeLeon said participants kick off the day with a continental breakfast and they receive TEAMBuild T-shirts. Then they have lunch with a veteran family who qualified for a home. They also get invited to special events and have their participation announced to the media. A contribution of $5,000 allows them up to 20 TEAMBuild participants, with packages available for groups of up to 60 participants. “They develop a support system for each other within their community,” said Bridgett Mills, senior director of Program Design and Urban Planning. They also have support from the larger community, she added. Braly emphasized that partnerships are key to the success of the Homes4Families program. In addition to the city of Palmdale, the Vets4Veterans organization became a partner. Tom Hilzendeger, president and founder of Vets4Veterans, said he has a veteran family that was homeless already living in a Lancaster home his group purchased and renovated — that group’s first home. It is meant as a transitional dwelling for temporary residents. That family is expected to eventually move into a house in Palmdale’s Veteran Enriched Neighborhood. Veteran families that qualify for the Homes4Families program must be at a low-income status, and have some source of income to pay a mortgage. They must also be first-time home buyers willing to contribute 500 hours in the construction process. Sophia Reyes, the housing coordinator in Palmdale’s Neighborhood Services Department, said both her sons are Marine veterans and the Homes4Families program gives them hope. Palmdale City Councilwoman Laura Bettencourt said she not only supports the project as a city official, but also backs it for personal reasons. “We have the Air Force Base as our neighbor.” In addition, Bettencourt said her father and her stepfather served in the same war, at the same time. Her grandfather, a World War II veteran and part of the Greatest Generation, suffered severe Post-Traumatic Stress Disorder. 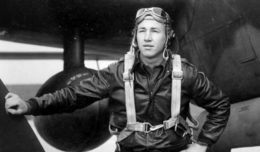 Because he dealt with financial hardships, he lived in a Quonset hut, where he committed suicide. That experience makes the Homes4Families project deeply personal to her. In addition to larger financial contributions and the corporate and group TEAMBuild programs, opportunities for individuals to get involved with Homes4Families are also available. A “Hard Hats for Heroes” Club is available, which accepts monthly contributions of between $10 and $50, which go directly to building homes and futures for low-income veterans and their families. Opportunities for individual build volunteers are also available throughout the year. Veterans who are in need of housing are invited to begin the application process at any time. To qualify, you must have a DD-214 with an honorable discharge or code equivalent, be low-income, and a first-time homebuyer (must not have owned a home in the last three years). Lack of creditworthiness is not an obstacle to applying. Assisting applicants with financial counseling and credit repair is part of the service offered by Homes4Families. To get involved, visit www.Homes4Families.org, or call 818-884-8808.8808.